Using plastic bags in some areas around the country is now restricted.But ban on plastic bags increases the use of paper bags. Paper requires the cutting of 17 trees to make a ton, the use of one gallon of clean water to make just one paper bag, and excessive use of energy which partly uses oil. This is the same reason why they imposed of not using plastic bags anymore. So I've decided to make something out of paperbags instead of throwing it away and causing harm to the environment. 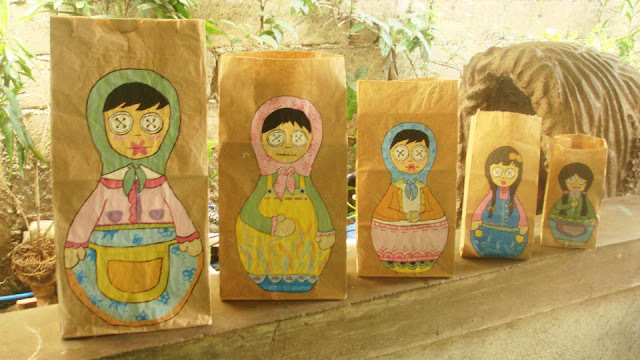 I've painted Matryoshka dolls. Matryoshka doll refers to a set of wooden dolls of decreasing size placed one inside the other. Also called as Russian nesting doll. Nesting dolls are often used as symbols of Russian culture, but matryoshka dolls have their origins in similar dolls made in Japan.